The former Northern Ireland secretary Theresa Villiers has warned that Britain is in danger of remaining in the European Union “in all but name”, as senior Conservatives continue to air their differences over Brexit. Villiers, one of six cabinet ministers from David Cameron’s team who campaigned for a leave vote in the 2016 referendum, has used an article in the Sunday Telegraph to warn against a “dilution of Brexit”. She becomes the latest high-profile leaver to voice doubts about Theresa May’s approach following a speech last week by Jacob Rees-Mogg, chair of the influential European Research Group of pro-leave MPs, in which he accused the government of being “cowed” by Brussels. Leavers are concerned about the nature of the “implementation period” after March 2019, which is expected to involve the UK accepting the jurisdiction of European court of justice, and have been alarmed by reports that officials are seeking to extend the period beyond two years.The chancellor, Philip Hammond, enraged pro-Brexit ministers and backbenchers last week by saying in a speech in Davos that the UK’s trading relationship with the EU would change only “very modestly” after Brexit. A backlash in Westminster later forced Downing Street to distance the prime minister from the remarks. Villiers says she supports “compromise and moderation” in the UK’s approach to the negotiations. But she adds: “That said, I understand why some are becoming nervous about the current situation. Since the prime minister set out a bold vision in her Lancaster House speech, the direction of travel seems to have gone in only one single direction: towards a dilution of Brexit. She urges May to resist the “immense pressure” to “water down” the approach set out at Lancaster House last January, when the prime minister said Britain would be outside the single market and the customs union. May has so far largely managed to keep a lid on the divisions within her party over Brexit, but privately ministers admit there are deep differences at cabinet level about how much the UK should hope to diverge from the EU in the future. The foreign secretary, Boris Johnson, plans to deliver a speech about what he calls the liberal case for Brexit in the next few weeks, potentially sparking fresh discord if it appears to differ from the prime minister’s approach. Is it really any wonder that our politicians have so little clue regarding how to achieve BreXit when so very few of them understand for a moment how the EU functions, what its foundations are, what its aims are or how its legal system works. It is not that the British peoples were not warned of the dificulties & pitfalls that lay ahead during the original Peoples Petition of the 1975 Referendum (CLICK HERE) you must be sure to understand the utter corruption of that Peoples Vote by the lies, distortions &dishonesty of politicians, pro EU (or as it was then ‘Common Market’), media & self proclaimed pundits aiming to personally profit at the expense of Britain’s ensnarement CLICK HERE. The peoples of Britain, as I said, were warned – had they paid attention to the, at the time un broadcast debates of the House of Commons – recourse to the verbatim text as published will show the dire nature of this warning by the very few who had taken the trouble and had the intellect to understand the foundations, aims and treaties of the EU – those who had studied the works of Monnet, Spinnelli, Walter Funk and the like. You may well be old enough to remember the fact that during the preamble to the 1975 Peoples Vote a leaflet was delivered to every home, in which the Prime Minister of the day the odious Ted Heath catagoricly stated ‘This will lead to NO essential loss of Sovereignty‘. It was not until later in life when interviewed by David Frost that Heath admitted he has ‘deliberately lied as he knew that if he had told the truth the British peoples would not have voted to remain in the Common Market‘! 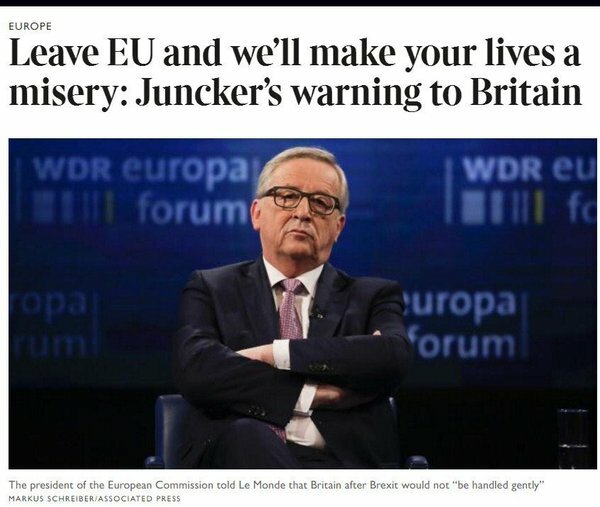 You will have heard the professional EU Bureaucrats endlessly saying the UK must tell us what they want – this is a totally dishonest spin to a British politician, journalist or audience, it is a poor translation of the continental political language failing to explain why! ‘The British team in these discussions, since it is they who have opted out of our EU project (social experiment/scam), must consult the details of the EU Treaties which they signed and then line by line, word by word decide exactly what they want and we will see if that is possible, based upon the letter of the law‘. 1. No one, be they individual or body, subject to the law may do anything and none subject to the law has any rights unless there is a specific law granting them that action or right, where they do not impede the State. 2. The letter of the law is the law, to be rigidly imposed in co-operation between the Police & a panel of magistrates aiming to prove guilt, whilst frequently holding the suspect for long periods without Habeas Corpus whilst evidence is gathered without interpretation or negotiation, precedent or intent being considered. Liberty is thus granted by License of the State, thus one starts to understand why the terms of the motto of the French Republic which is “Liberty, Equality, Fraternity” (Liberté, Equalité, Fraternité) loom so large. The notions of liberty, equality and fraternity were linked by Fénelon at the end of the 17th century, and the linkage became widespread during the Age of Enlightenment. The importance of this motto/slogan is that The French Revolution was much to do with the granting of these rights by the State to the people of France. The Barons’ Charter of 1215 and as you will be aware that The Magna Carta CLICK HERE lies at the core of the Law of the Anglosphere, and more, around the world. Little wonder that British politicians considered Law to be largely founded on the same principles & values of Justice as pertained across the Anglosphere. Now perhaps the problem becomes a little clearer as one realises just how allien to the concepts of Law & Justice this is from a British perspective. British law is founded on fundamental principles also, though with no relationship with either Roman Law nor Code Napoleon, in fact British Law is diametrically opposed to EU Continental law. 1. Every subject of the law is empowered to do absolutely anything they wish and has absolute rights of freedom in all aspects save where those actions or freedoms are legally defined and denied for the general benefit of society. 2. The Law shall be imposed by a Civil Police but judged by a Jury of one’s peers where a very clear presumption of innocence until proven guilty is empowered by Habeas Corpus – it will be the duty of the Court under the guidance of its Chairman, usually a Judge or panel of Judges to adjudge & sentence based on Precedent and interpretation of Intent of the Law. 3. Britain does however include alongside the principles of Justice as shown the benefit of both Tort & Contract Law, though clearly they are within the 2 primary principles of British Law. It must also be noted that under the broad brush of British Law there is the variance in some aspects under Scottish Law as for that matter under both Welsh and the less well known & largely arcane Marcher Law where particularly in the latter two there are quite notable variences of Regality, but to digress there is entirely another juristiction, little understood in mainstream British Law circles. It is worthy of note that: In certain instances, different jurisdictions’ law may apply to a tort, in which case rules have developed for which law to apply. This occurs particularly in the United States, where each of the 50 states may have different state laws, but also may occur in other countries with a federal system of states, or internationally. “Across a largely unified legal area Corpus Juris will provide a simpler, fairer and more efficient system of repression“. It is clear from this statement of principles that under EU Law the Law is seen as being for the State to REPRESS the peoples whereas under British Law it is clear that the Law is managed by the State with separations of Legislature, Justice & enforcement for and on behalf of the peoples. It can not be claimed that this is in some way a translation error as on investigation of the EU manual in translation into French, German, Italian & Dutch or from those languages to English there is no difference in the intensity of the odious concept of ‘Repression’! Thus very clearly a great difference can be seen in the disparity between EU Law and British Law – Hence our politicians are trying to function under a total misinterpretation of the Law, they still seem to believe they are in some way negotiating based upon British principles rather than the reality which is that they are bound by EU Laws that have foolishly been signed by a series of relatively good salesmen who have sold the public on trusting them yet have abjectly failed in their duty to find out what it was they were signing, whether due to criminal dishonesty or crass incompetence is hard to tell. 1. Those members of the legitimate electorate who excercised their electoral right to withold their vote. 2. Those members of the legitimate electorate who voted unconditionally to Remain in the EU, including those who are sworn to and paid to act in the interest of the EU not that of Britain. 3. The clear and undeniable majority of the voters legally empowered to vote who voted unconditionally to Leave the EU. It is therefore the clear and indisputable duty of our politicians whether elected or imposed (eg. House of Lords + Bishops) to acquit their duty and enact the democratic wish of the electorate at large, meanwhile ensuring they act to obtain such a transition in a peacefull and efficient manner to the best of their ability (seems very limited!) in the interest of the Country at large. Do be minded there was neither a vote nor was there the intent that the British peoples should merely Leave the EU in name whilst continuing to be a vassal to its odious system of law and its hugely damaging terms of membership. 1. Clearly had the British peoples believed that EU membership was in general beneficial they would not have voted to Leave, therefore it is clear they deemed it damaging. 2. A measure of that damage is clear when one considers the fact that it will take many years to recover from the damage it has caused, as is becoming daily more apparent to the politicians as they awake from their self interested torpor – already they are admitting that although we joined within a matter of hours it will take at least 4 years to withdraw and in my opinion nearer 10 years to recover and start to power ahead. It is now, having had 2 years of dealing with the issues of BreXit, increasingly clear that those remaining in the EU have every intent to force on Britain, in a totally undemocratic manner, with little but contempt for the democratic choice of the British peoples their wishes as to how they aim to enforce Repression. It seems to the freedom loving peoples of Britain this is being carried out in an obdurate & mallicious manner in the realisation that if Britain is allowed to make a success of Leaving the strangle hold of the naiscent State of EUrope others who value Liberty will probably yoin the Fraternity outside the EU and the binding nature of Roman Law and the Repression it brings with it! British politicians were empowered to make one of 3 choices by the Peoples Vote of 2016 wherein the vote was the largest vote in British history which was very clearly made, by a majority of 4%, to unconditionally Leave The EU (BreXit). You will note that almost every Government has been voted into power by a majority of far less than 1,300,000 votes! Even & despite rigging the vote in such a manner the margin of the majority was a mere 0.302% of the electorate (around 6,000 vote majority), yet the result was still foist, if not forced, on the peoples of Wales with what can only be described as divisive results displaying a comedic level of contemptible incompetence amongst the low grade superannuated Council members & officials associated with the resultant EU regional assembly empowere under Articles 263, 264 & 265 of The Council of the Regions, a Limited Company registered in Paris! In the i9nter5vening 21 years since the folly was enforced I have yet to find a single solitary individual of credibility, competence or authority who can, despite the vaste cost of replacing a Secretary of State for Wales & a handfull of Civil Servants with 60 elected Assembly Members & 1,000s of flunkies and apparatchiks, not one can provide a single solitary benefit for Wales or its peoples of any consequence. Largely as a result of Labours control of the Assembly, risibly called the Welsh Government as if Wales or the Welsh language were of any consequential significance on the world stage! Meanwhile the NHS in Wales under the control of Labour, the Assembly & the corrupting influence of the odious crachach is in near collapse with areas labouring behind any equivalence in the rest of Britain! 1.) A negotiated settlement, but as we have seen this is most unlikely. 2.) A BreXit without an agreed settlement which is increasingly likely. There is no other possibility that respects democracy or the wishes of the people as made very clear in the Peoples Vote. The people made it very clear they considered the very worst outcome, which was clearly unacceptable, was to Remain in any way, shape, manner or form in the EU. that gave rise to the obvious vote for BreXit with, in % terms, a vote majority 12 times that which Labour forced on Wales relative to the EUs clamouring for devolution & division of Britain into 13 EU Regions – a decision that reduced Scotland from its Westminster special national status & Wales from its proud position as a Principality sharing in its own Governance at Westminster to being no more than a footling region of the EU rubber stampin EU edict akin to The East Midlands, SE Region or the like. Now lets get on with it and deal with the problems as they may arise whilst taking immediate advantage of the very obvious benefits and opportunities BreXit brings as we re-establish our rights, repatriate our democratic control, re-institute our Justice system, re-envigorate our industry & GDP, restore our borders, retrain our Civil Service, re-enfranchise our NHS, rejuvenate our values & enthusiasm & revivify our can do ambitions whilst repairing our social services for the genuine in need rather than pandering to Socialist requirements to bankrupt the society & our country to fulfil their need to buy votes for their proven catastrophic aims. There will obviously be difficulties & costs in implementing a no deal #BreXit in the short to mid term but it is a huge improvement over remaining shackled to the #EU which has shown it is no friend of ours & is trying to punish us to prevent its own collapse & disintegration. I trust this article aids comprehension of the issues surrounding BreXit & the problems therein and just how the longer we were shackled in tyhe EU the more complex & costly leaving would be and clearly the more obviously essential leaving had become. Yes BreXit will, as a result of 50 years of folly, no connection with ’50 Shades of Grey’, both the difficulties and the costs will be significant but clearly we will also be in a position to take advantage of the benefits of BreXit from the start – it is upto us to capitalise on the benefits and grab every opportunity BreXit grants us and not like born losers keep harping on about the problems. I never saw my Country as a prostitute to be sold on the international market for financial gain – there are a huge number of benefits that far outstrip financial considerations for a start it is a huge benefit to have the chance of living standing on our own feet rather than existing with a life on our knees at any price. It is time to wish Britain good luck and strive for the best possible outcome liberated from the EU for future generations – just like the Peoples Vote ‘It Is Up To You’. That was a very interesting read. We should always be mindful of the fact that euroscepticism has never been a left-right issue and indeed it until the early 1990s many (perhaps most) of the great British eurosceptics were of the left. The best ever eurosceptic speech by British politician was made by the then-Labour leader Hugh Gaitskell. During the 1975 referendum, Michael Foot, Barbara Castle and Tony Benn were at the forefront of the No campaign, with Enoch Powell the only high-profile right winger (though by then not a Conservative) of the campaign. Margaret Thatcher posed in a silly jumper with European flags on it. Norman Tebbit won’t mind me pointing out that he supported Yes in 1975 and that his proud track record as a eurosceptic only really began around the time of Maastricht in the early 1990s. Tebbit has jokingly used the ‘sinner who repents’ quote from Luke’s Gospel when reminded of his former pro-EEC views. The 1975 campaign was rigged in all sorts of ways. There was an official mail-shot from the Yes and No campaign, and then there was another mail shot from the official Yes campaign, justified on the grounds that it was ‘the opinion of the Government’. A similar tactic was employed with the official Government booklet that was sent to every home in the country at the cost of £9 million in the run-up to the 2016 referendum. The BBC’s part in manipulating public opinion in favour of the EEC in the 1970s was fully explained in the Radio 4 documentary ‘Letter to the Times’ (broadcast on 3 February 2000), which deserves to be far more widely recognised and made available to listen to somewhere. Contributors included Sir Edward Heath, Roy Hattersley and Conservative Party marketing man Geoffrey Tucker, who was in charge of the campaign. Every national newspaper with the exception of the Morning Star favoured membership of the EEC. Trethowan was close to Heath AND the security services. He became Director General of the BBC between 1977 and 1982. He was far too cosy with the political establishment to hold the role, and subsequent revelations about him in documents declassified under the 30 year rule back this up. De Manio was said to be uneasy with the change in format to the Today programme that took place in 1970. De Manio was a light-hearted, humorous man and when the move to a two-presenter format that year was introduced, he felt it didn’t suit him, and he left the programme following year. He was given a ‘sweetener’ which may have helped him move on. He was unhappy with the new format of the Today programme, and the ‘double header’ came with a more newsy, serious tone to the programme. A popular personality, he was given his own afternoon programme ‘Jack De Manio Precisely’ which began the following year and ran for most of the 1970s, in which he interviewed everyone ‘from gardeners to ghost hunters: from poets to pop-stars; from cantors to crime-writers’. Did he fall or was he pushed? We can now say with certainty that Government pressure placed on the BBC was the primary reason for his departure. John Mills did an admirable job in the 1975 campaign, faced with limited resources, an almost-entire print media that favoured a Yes vote, and a broadcast media that had been ‘nobbled’ in favour of Yes by Tucker and co, acting on behalf of Heath. The 1975 referendum was rigged in other ways, but this is a prominent example. Euroscepticism ‘on the right’ only really came to prominence from Jacques Delores’s speech to the TUC conference in 1988 onwards, which Thatcherites feared would impose ‘socialism via the back door’ by reversing many of her government’s reforms. The Conservative Party displaced Thatcher within a few years of her twigging what the EEC/EC/EU project was all about. Euroscepticism and anti-Maastricht sentiment only really shone from 1990 onwards. Of course, not all leftists were ‘bought’ by Delors. Tony Benn stood his ground, placing democratic principles above all else (his famous ‘five questions’ of those in power are timeless – look them up if you don’t already know). I hugely admired the likes of Kate Hoey and Gisela Stuart in the run-up to the 2016 referendum, and the late Peter Shore, on the right of the Labour Party, should be regarded as one of the great euorsceptics this country has seen. And to this day, anti-EU campaigners come from across the political spectrum. George Galloway was for many years pro-EU, but the final straw for him came when the EU overthrew a democratically-elected government in Greece, and he went on to make some fine contributions to the 2016 Grassroots Leave campaign as a public speaker and on his radio show. The 2016 campaign for a Leave vote saw George Galloway, Arthur Scargill, Norman Tebbit, Jacob Rees-Mogg, David Davis, John Redwood, Kate Hoey and Gisela Stuart all on the same side.